I remade this recipe last weekend for lunch and loved it so much, I thought I would share it again with you. 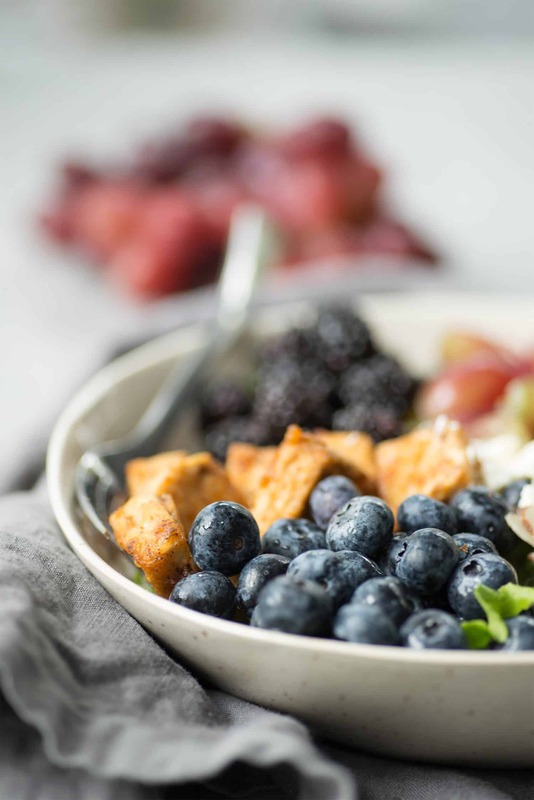 It’s my favorite salad to eat this time of year, when my fridge always has fresh berries inside just begging to be tossed with creamy almond dressing. Tofu, like tempeh, can be gross if you don’t prepare it properly. I spent most of my first years as a vegetarian with soggy, bland tofu dishes. In fact, the first block of tofu I ever bought I ended up throwing away because I couldn’t force myself to actually cook with it. Now? I’m a tofu-loving machine. Baked, fried, raw in eggless salads, pureed, or whipped, it’s a food that I just can’t get enough of. I think it’s always worth mentioning that most of the negative things you hear about tofu are wrong. Yes, soy is a GMO crop, but it’s very easy to find non-GMO tofu if that concerns you. In fact, it’s easier to find organic soy products than regular. Why? Well, 85% of the soy grown goes directly to animal feed. If you head to the store to pick some up, I’d bet that most of the options available are labeled organic. If you’re interested in more, I wrote about the health benefits of soy here. OK, back to cooking. If you’re new to tofu, I’ve got two fool-proof ways to enjoy it. The first is my bake, marinate and saute method that I use in my peanut buddha bowls. 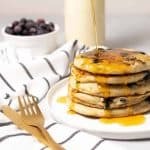 That recipe has been shared hundreds of thousands of times and consistently gets rave reviews. Honestly, I think it’s because the tofu doesn’t taste like tofu. It’s golden, chewy, and perfectly covered in a savory peanut sauce. While I love that method, it also takes a bit of planning and the use of a marinade. For nights when I want chewy, perfectly fried tofu without a ton of oil, I use this bake method instead. Please promise me that even if you’ve had tofu before and don’t think you like it, you’ll try this. I even made you a video (below) that shows how easy it is. First things first, you need to press your tofu. 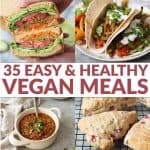 I wrote an entire beginners guide to tofu if you want more information, but pressing tofu allows the water to be removed so it can bake up properly and absorb whatever seasoning you’re using. Not pressing the tofu often leads to soggy tofu. Take it from me and years of not figuring out the beauty of pressing. Then, cover your cubes in a base of soy sauce (or tamari for gluten-free option), a little olive oil and whatever seasoning you’d like. From there, toss in a bit of arrowroot starch or cornstarch. This allows the tofu to get really golden and crisp, without having to deep fry. Honestly, I eat about half the pan once it comes out of the oven. It’s just so, so good. But, I’m guessing you came for more than just crispy tofu. Sometimes, when I’m in a recipe rut, I’ll search recipes with chicken for ideas. I know that I can replace just about any chicken-based recipe with a tofu one, especially when it tastes as good as this. 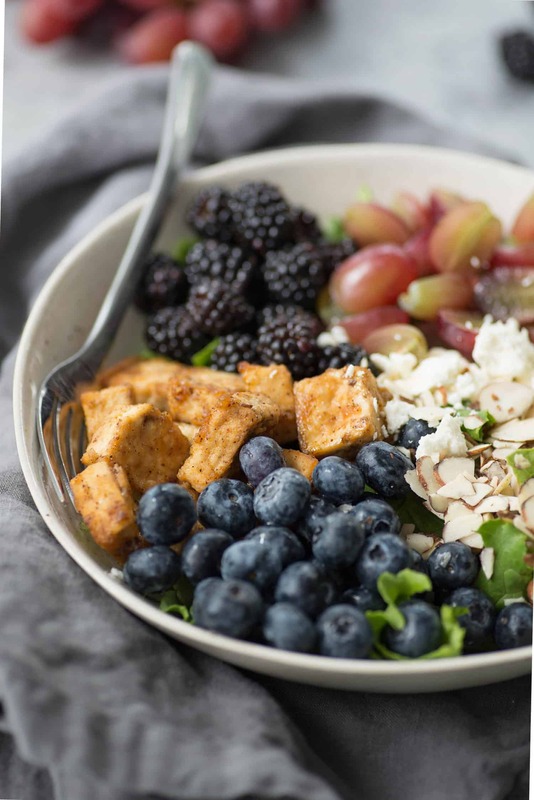 I stumbled upon this berry salad recipe from Pinch of Yum and instantly knew I wanted to recreate it with tofu instead. I’ve been on a huge fruit kick lately and this salad looked so refreshing; especially with all of the various textures. So, I baked the tofu, then added in plenty of blueberries, blackberries and grapes. You could almost stop there, with the slightly-spicy tofu and juicy fruit. Almost. To finish things off, stir in a healthy serving of toasted almonds, feta and a creamy almond-butter dressing. This is going to be my salad of the summer. P.S. Still not convinced that this is the secret way to enjoy tofu? Well, I made you a video to try and hammer that idea home. Peer pressure! 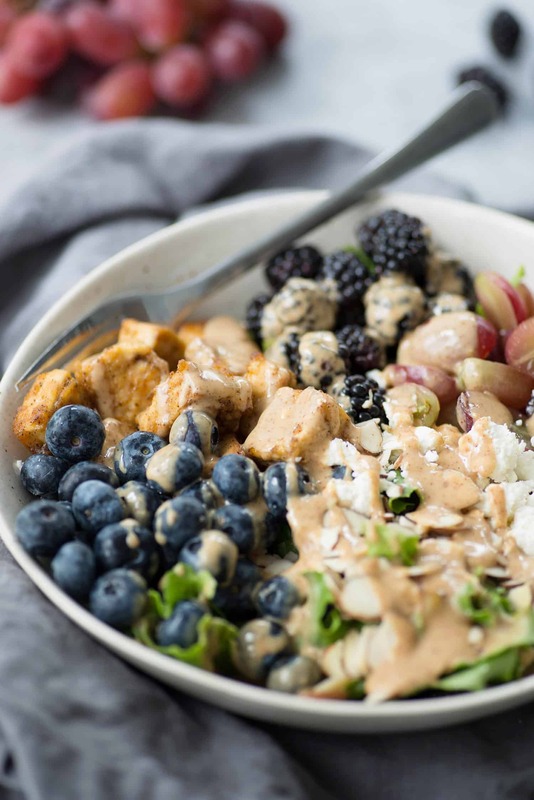 Rainbow Berry Salad with Almond Dressing. 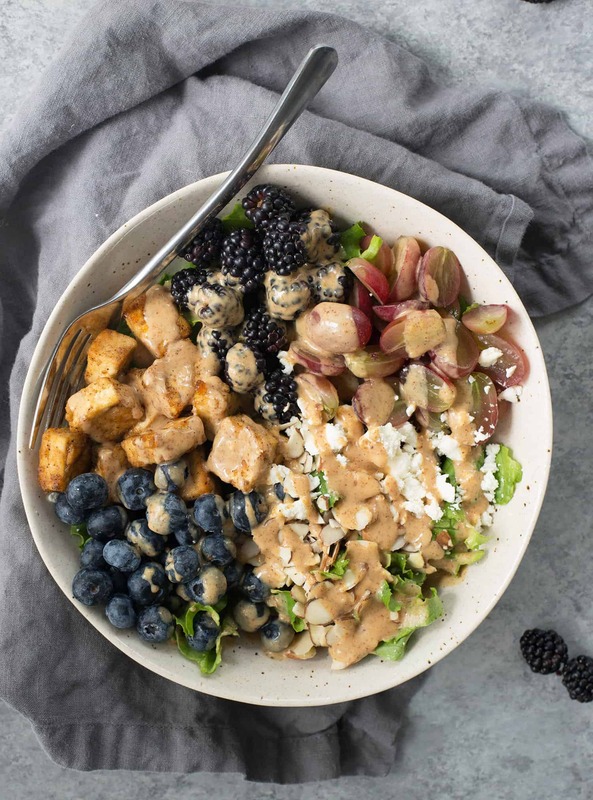 This salad is bursting with fresh fruit, crispy tofu, feta, almonds and a bright almond-butter dressing. Vegetarian and gluten-free. Adapted from Pinch of Yum. Preheat the oven to 400 degrees F. Line a large baking sheet with parchment paper and set aside. For crispy tofu, it needs to be pressed first. Wrap the tofu in a kitchen towel or paper towels and place a heavy object on top, like a pan or cans. Let drain for at least 15 minutes. Unwrap the tofu and cube, then place in a large bowl. Toss with olive oil, soy sauce, arrowroot starch and chili powder until the tofu is evenly coated. Place on the baking sheet and bake for 25-30 minutes until golden brown and crispy. Set aside while you prepare the rest of the ingredients. Whisk together the ingredients for the dressing. Season to taste with salt, as needed. Depending on the consistency of your almond butter, you may need to add a bit more water to thin it out. Place all ingredients to the salad in a large bowl and add the dressing. Toss well to combine, then divide among 4 bowls and serve. The tofu can be made ahead of time and eaten cold or reheated in a pan or in the microwave. Looks lovely. Is there something that can replace the feta, or leave it out, without changing flavors? Hi Sharon, hard to say as feta gives a distinct salty taste. That being said, perhaps avocado? Or, leave it out. The dressing is pretty creamy by itself. I love, love, love this salad! My husband even enjoyed the tofu which is a rarity! Thanks for your fantastic recipes! So glad you like it! Yes, that tofu is one of my favorites! This looks AMAZING! Can i come over and you can teach me your tofu secrets! ?